The Troy VTX Round Head Urethane Encased Dumbbells with 28 – 34 mm Chromed Straight Steel Handles offer Durable, affordable and ergonomically engineered dumbbells for a customized feel that delivers maximum comfort. TROY Barbell carries a wide variety of dumbbells from the highest quality pro style dumbbells to the basic cast hex dumbbell, all built with the user in mind. The Troy/VTX Round Head Urethane Encased Dumbbells with 28 – 34 mm Chromed Straight Steel Handles offer Durable, affordable and ergonomically engineered dumbbells for a customized feel that delivers maximum comfort. 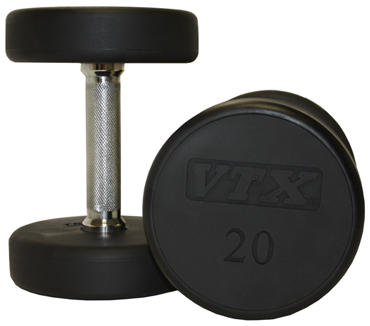 Call 1-800-875-9145 with any questions you may have about the Troy VTX Round Urethane Dumbbells 30-50lb Set BD-030-050-US. 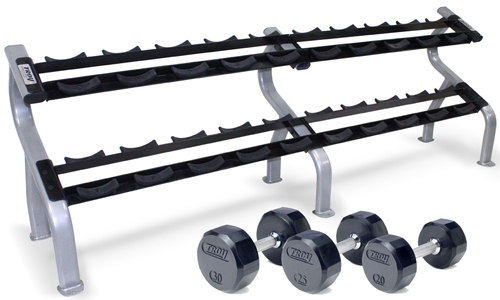 Order your Troy VTX Round Urethane Dumbbells 30-50lb Set BD-030-050-US from FitnessZone.com today! Order your Troy VTX Round Urethane Dumbbells 30-50lb Set BD-030-050-US from FitnessZone.com today!